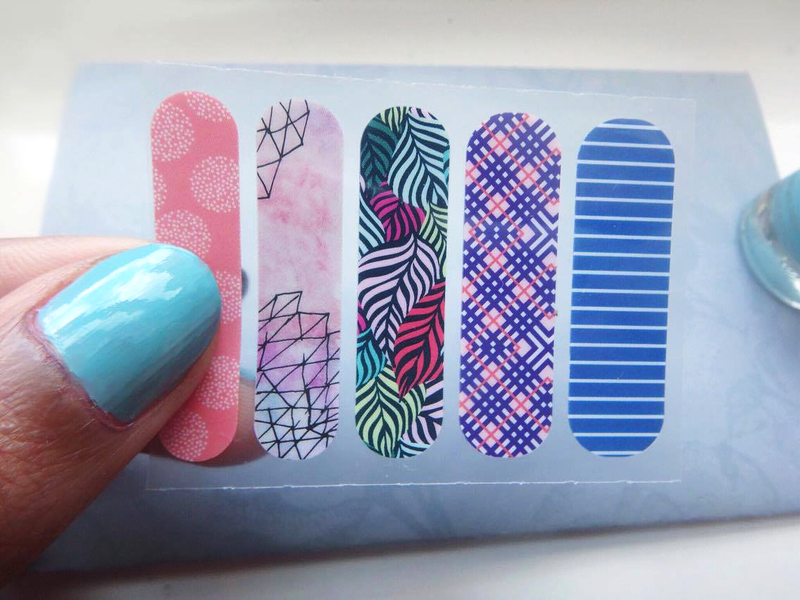 Jamberry is a beauty brand that provides a simple, at-home solution to professional nail looks - in the form of nail wraps which can simply be stuck onto the nail. 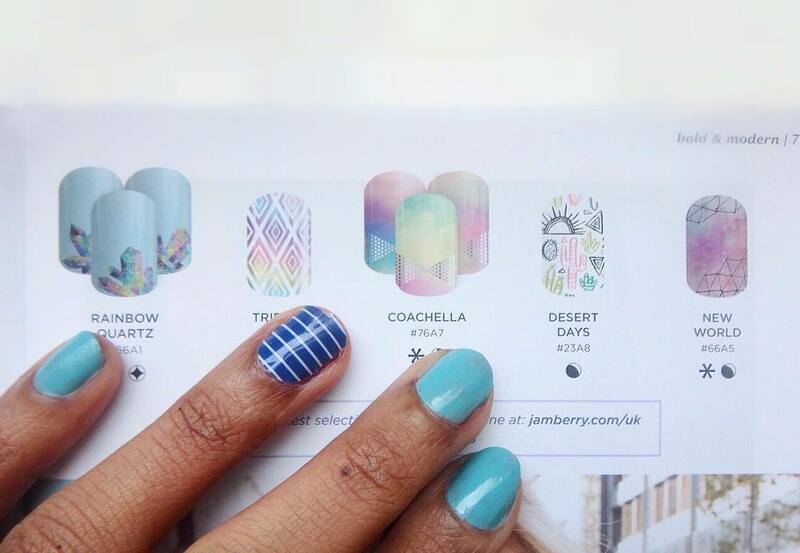 Jamberry has tons of extremely cute and trendy nail designs to choose from on their site - from Coachella inspired nails to galaxy designs, to some more sophisticated and demure nail looks. There is definitely no shortage of enviable nail wraps available in their catalog (I kind of want them all). 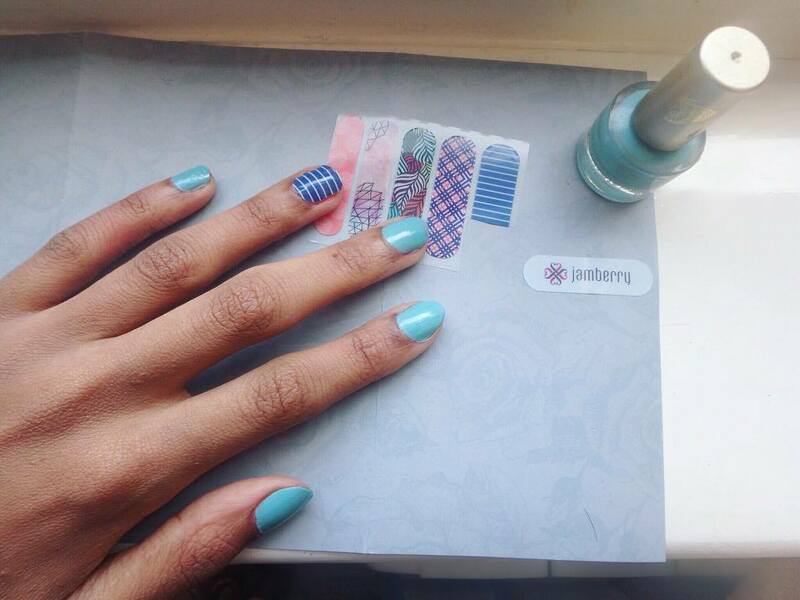 Lucky for me I was kindly sent over some samples by Claire at Jamberry, to try out for myself! I received five different nails styles in the post. I first tested the water by trying only one of the styles on each ring finger, amongst loosely matching painted nails. After a few days I then decided to switch things up and wore the remaining four altogether, alongside a painted thumb to tie together the colour scheme. Even though each nail wrap I was given differed, I actually thought they looked pretty cute together. My favourite design out of the five was definitely New World; I loved the pale pink/purple water colour effect and the geometric design. 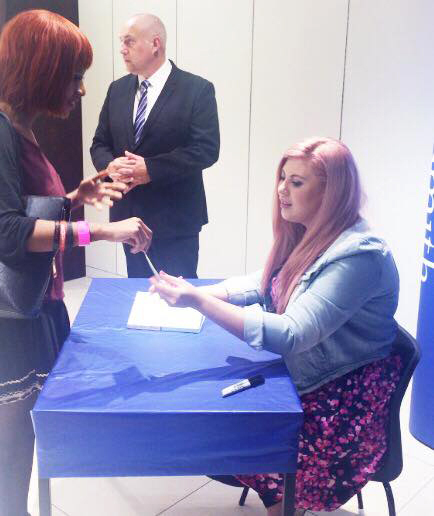 As these were samples the wraps didn't all fit my nails perfectly. But when you purchase your Jamberry nails you receive a range of sizes (and then some), so you'll be able to choose the perfect fit for each finger nail. The application process is really simple too. All you need to do is cut your chosen wrap to the length of your fingernail, apply a bit of heat to the sticky side of the wrap, stick the wrap to your nail, trim to match your nail perfectly, and then finally apply pressure so the wrap is nicely secured to your nail. I found the process quite fun, especially once I got to see the end result. Jamberry state that their wraps last for well over 7 days, and from my experience with them that does appear to be the case! 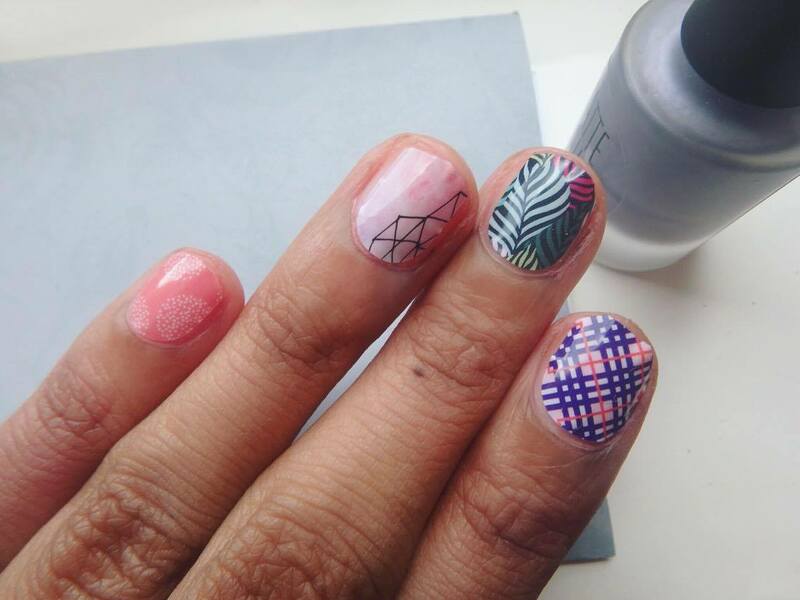 Jamberry nail wraps are a great option for me as I don't really like false nails - I find them too clunky. 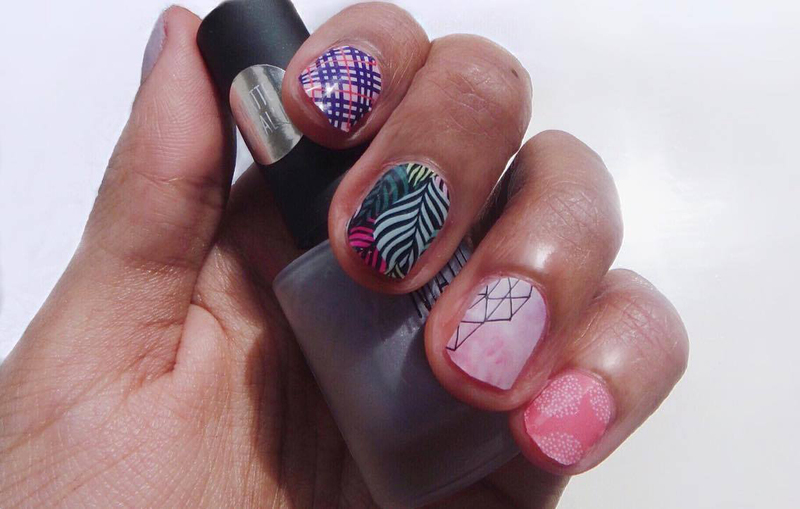 But Jamberry provides a more relaxed and lightweight way to experiment with different nail designs, which I really appreciate. 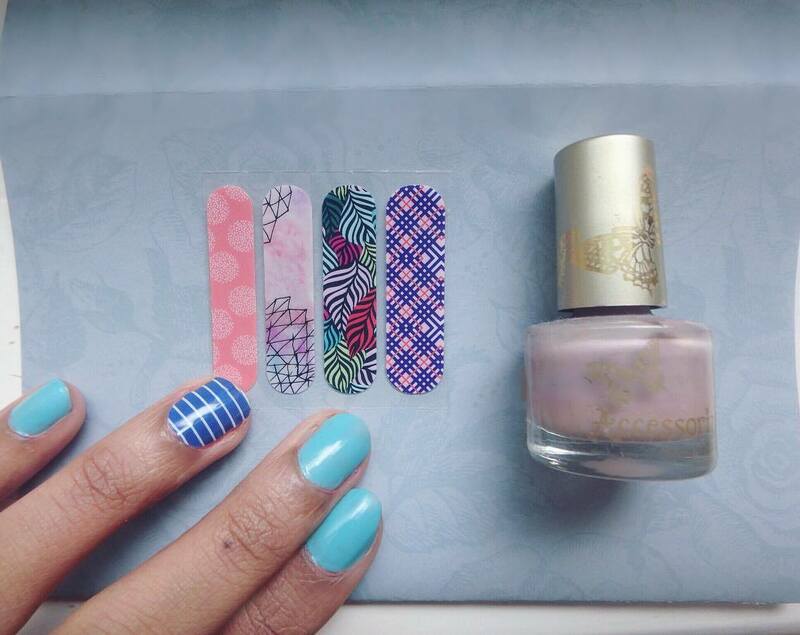 And with so many pretty designs available I definitely see myself purchasing more nail wraps from them in the future. 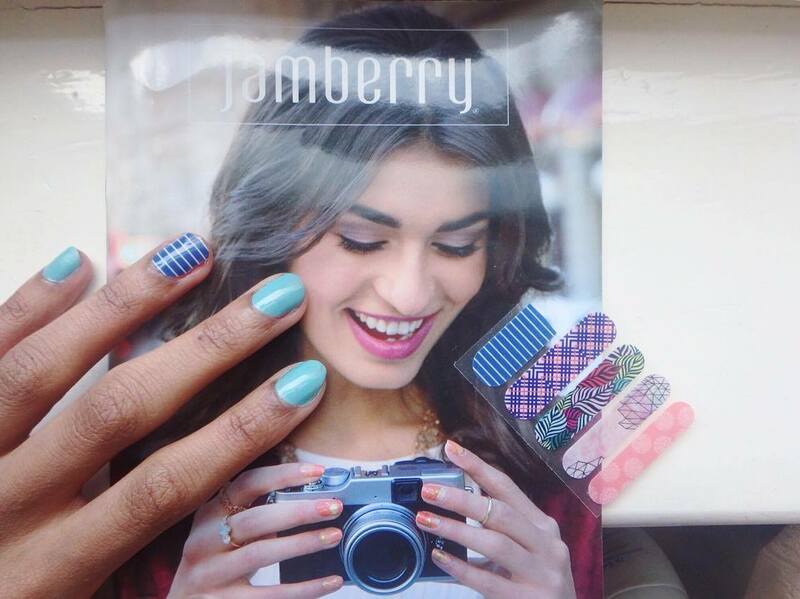 Click here to have a browse of Jamberry's UK shop. You can also join Claire's Jamberry Facebook group here. Disclaimer: This item was sent to me for free in exchange for an honest review. All views are my own. 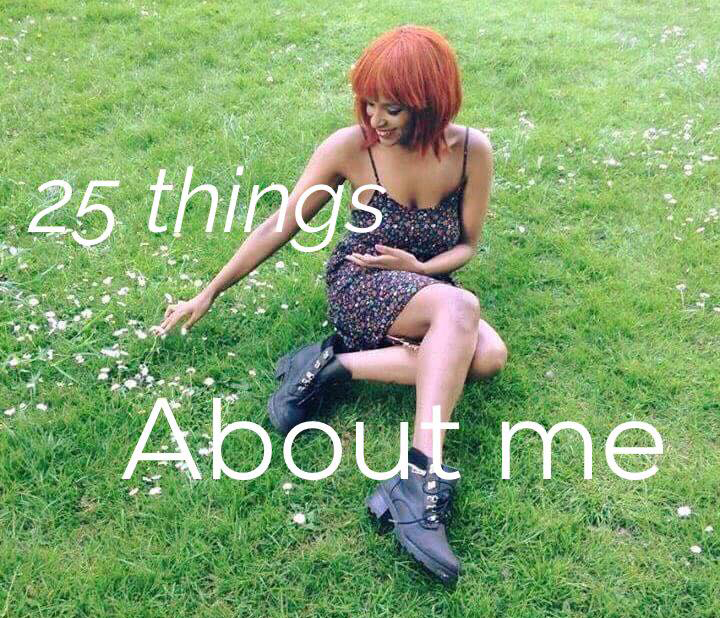 I was kindly tagged by Karishma from This Adventure Of Mine to answer 25 questions about myself. Here are my answers to those questions! 1. What's your middle name? I have two; Azadeh & Ruth. One is from my Iranian side of the family and other from my American side (named after my grandmother). 2. What was your favourite subject at school? I think this definitely varied over the years. In secondary school I remember enjoying media, in college (before university) I definitely really enjoyed English literature. 3. What's your favourite drink? Non alcoholic? Slightly random but I am obsessed with elderflower cordial. Alcoholic? I usually drink vodka because it doesn't have much of a taste and can blend well into other drinks! 4. What's your favourite song at the moment? The last few months my favourite song has been Taro by Alt J. It's an amazing song! 5. What's your favourite food? I struggle to answer this because there's loads of foods that I love. 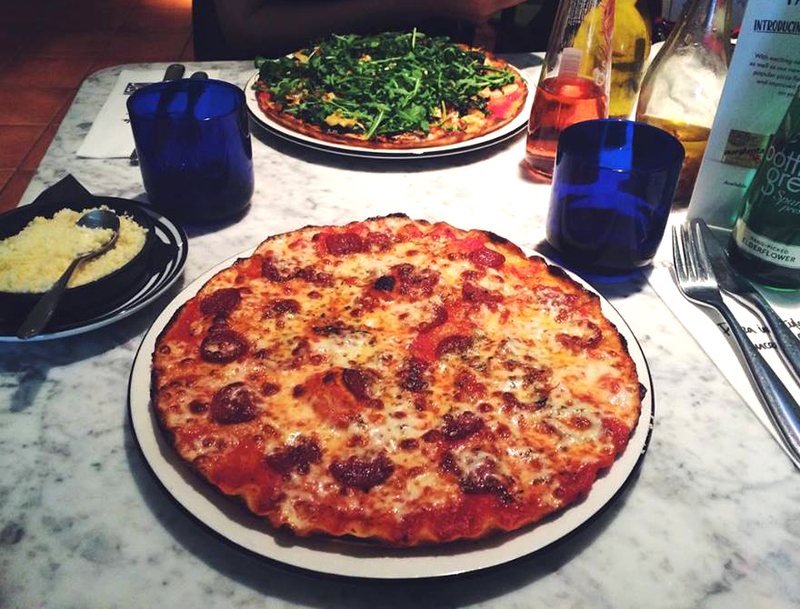 To give a safe answer I'll say pizza. I think it's universally accepted that pizza is amazing. 6. What's the last thing you bought? The last thing I bought was a packet of popcorn! But if we're talking more exciting purchases then I bought a few clothing items recently. 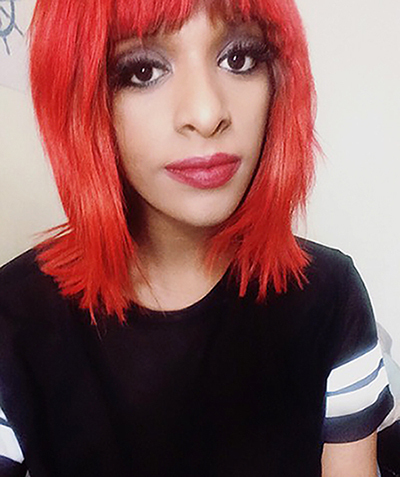 This mesh top from H&M is one of my favourites out of those purchases. 7. What's your favourite book of all time? I have so many! To name a few; To Kill a Mockingbird, Mrs Dalloway, The Thirteenth Tale, The Accident Season, I Capture the Castle, Daughter of Smoke and Bone, the Night World Series. 8. Favourite colour? To wear, definitely black. But colours that I just like to look at are dusty pink and duck egg/pale blue. 9. Do you have any pets? Unfortunately I do not. But I would love to have a dog. 10. Favourite perfume? At the moment I really like 'First Love' by The Library of Fragrance (it smells of flowers and Love Hearts). 11. Favourite holiday? There have been a few good ones. But the one that stands out is when I travelled the U.S. for nearly a month. 13. 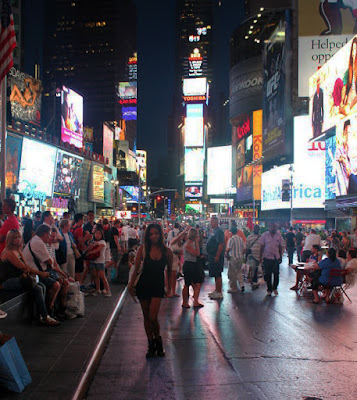 Have you been out of the country, if so how many times? Maybe around a dozen times? 14. Do you speak any other languages? I understand Farsi. 15. How many siblings do you have? One (half) sister whom I only got to meet for the first time last year! 16. What is your favourite shop? For clothes, H&M and Forever 21. I also like a lot of alternative online clothing shops, like Disturbia. 17. Favourite restaurant? I honestly can't choose, it depends on what I feel like eating at the time. And there's so many good ones. 18. When was the last time you cried? I think I actually cried yesterday. Oh dear. 19. 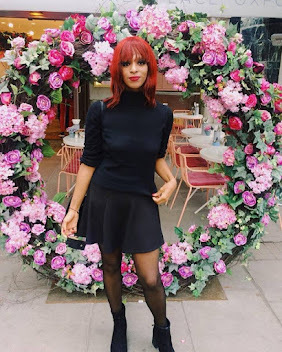 Favourite blog? Okay, these 'favourite' questions are going to be really hard for me, because I'm very indecisive and love a lot of things. For this I'll go with Sprinkle of Glitter as it's one of the first blogs that I remember getting into. 21. Favourite tv shows? Lost is my all time favourite TV show. I like a lot of sci-fi and fantasy shows. 22. PC or Mac? For the moment, PC. But I'm considering switching over in the near future! 23. What phone do you have? iPhone 5 (I think it's a 5?). 24. How tall are you? 5 ft 5.5! 25. Can you cook? I like to think I can, but I also don't experiment with cooking as much as I should. It's something I want to do more of. Thanks once again Karishma! I hope those reading have found out a few things about me that they didn't know before. And I now tag Beauty and the Bird, Motherhood Diaries, Cocktails and Cats, Crazy Little Thing Called Love, Woman in Progress and The Mamma Fairy to answer these same questions!